Most days, Lynsey May wears her responsible mask. This includes, but is not restricted to, being super nice to important clients, managing a small but occasionally highly-strung team of copywriters, paying her bills on time and being paranoid about the future. In the early and late hours, Lynsey’s mask is of a more flamboyant nature. She reads great dirty novels in the bath, eats buttery popcorn while thinking up bleak little stories, and put all of her real life worries aside while writing about the things she really wants to. One day, maybe the responsible mask will slip, and the fiery red fiction one will have a chance to gad about during the day too. Meanwhile, you’re sure to find one of the Lynsey’s online, along with some of the writing the night-mask has already insisted on. 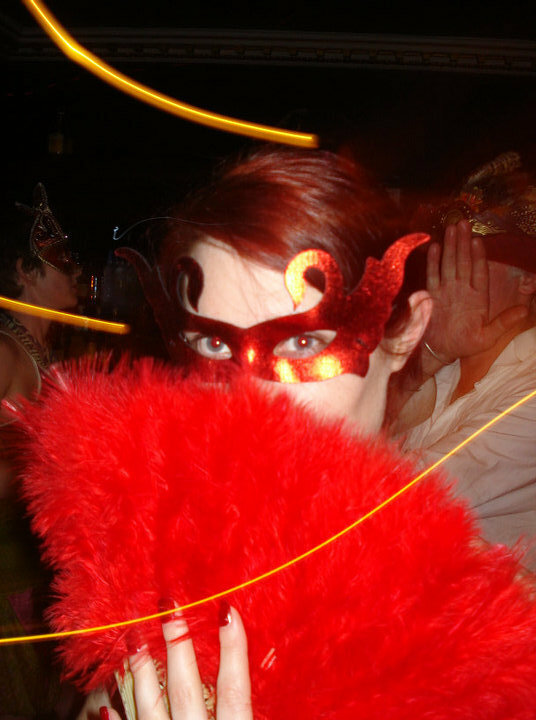 Love Lynsey’s mysterious red nighttime mask, such fun to be a juxtaposition of the daytime mask. I loved reading a bit of your blog. You sound delightful. BTW, I am now following you on Twitter. Your sense of mystery intrigues me. Mercedes, thank you for taking on this project. Gorgeous mask and delightful bio. I can totally relate to this. I have different mask depending on what I’m doing next. It seems you have to be someone different for each person and speak many languages too. Let’s see… there is, sports language, romance, finances. Vodka language is one of my favorites. The political and comedic as well seem to go hand in hand at time, and on some situations they are enemies. Too many to list, but I guess you can say I’m multi-lingual.